Excess Fluid Volume: Increased isotonic fluid retention. Fluid Volume, Excess (FVE), or hypervolemia, refers to an isotonic expansion of the ECF due to an increase in total body sodium content and an increase in total body water. This fluid overload usually occurs from compromised regulatory mechanisms for sodium and water as seen in congestive heart failure (CHF), kidney failure, and liver failure. Excessive intake of sodium from foods, medications, IV solutions, or diagnostic dyes are also considered causes of FVE. Other medical conditions that could contribute to FVE are hemodialysis, peritoneal dialysis and myocardial infarction. Restriction of sodium and water intake is vital for the treatment for hypervolemia in order to return the extracellular compartment to normal. Ultrafiltration or dialysis may be required for acute cases. Patient is normovolemic as evidenced by urine output greater than or equal to 30 mL/hr. Patient has balanced intake and output and stable weight. Patient maintains HR 60 to 100 beats/min. Patient has clear lung sounds as manifested by absence of pulmonary crackles. Patient verbalizes awareness of causative factors and behaviors essential to correct fluid excess. Patient explains measures that can be taken to treat or prevent fluid volume excess. Patient describes symptoms that indicate the need to consult with health care provider. 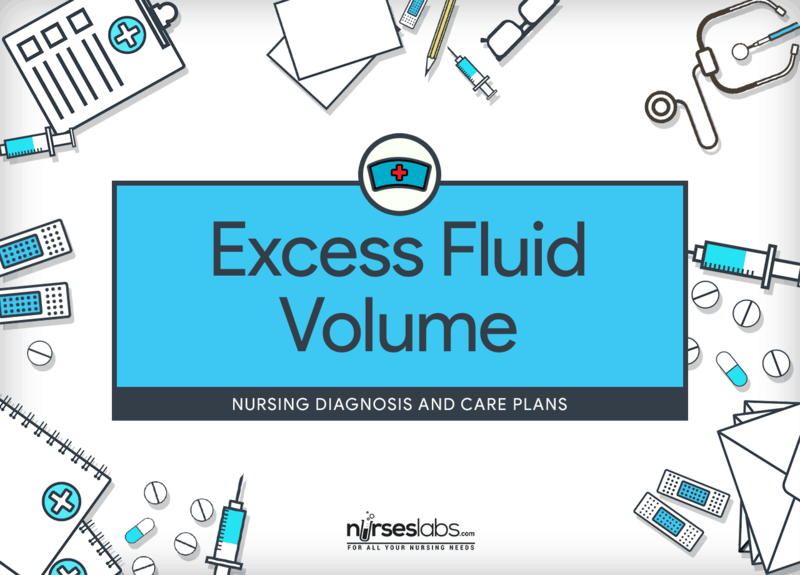 Assessment is required in order to distinguish possible problems that may have lead to Excess Fluid Volume as well as identify any incident that may occur during nursing care. Review patient’s history to determine the probable cause of the fluid imbalance. Such information can assist to direct management. History may include increased fluids or sodium intake. Monitor weight regularly using the same scale and preferably at the same time of day wearing the same amount of clothing. Sudden weight gain may mean fluid retention. Different scales and clothing may show false weight inconsistencies. Monitor input and output closely. Dehydration may be the result of fluid shifting even if overall fluid intake is adequate. Assess weight in relation to nutritional status. In some patient with heart failure, the weight may be a poor indicator of fluid volume status. Poor nutrition and decreased appetite over time result in a decrease in weight, which may be accompanied by fluid retention even though the net weight remains unchanged. Record intake if patient is on fluid restriction. Patients should be reminded to include items that are liquid at room temperature such as gelatin, sherbet, soup, and frozen juice pops. Monitor and note BP and HR. Sinus tachycardia and increased BP are evident in early stages. Review chest x-ray reports. The x-ray studies show cloudy white lung fields as interstitial edema accumulates. Assess urine output in response to diuretic therapy. Recording two voids versus six voids after a diuretic medication may provide more useful information. Medications may be given intravenously because FVE in the abdomen may interfere with absorption of oral diuretic medications. Note for presence of edema by palpating over the tibia, ankles, feet, and sacrum. Edema occurs when fluid accumulates in the extravascular spaces. Dependent areas more readily exhibit signs of edema formation. Edema is graded from trace (indicating barely perceptible) to 4 (severe edema). Pitting edema is manifested by a depression that remains after one’s finger is pressed over an edematous area and then removed. Measurement of an extremity with a measuring tape is another method of the following edema. Assess for crackles in the lungs, changes in respiratory pattern, shortness of breath, and orthopnea. These signs are caused by an accumulation of fluid in the lungs. Assess for bounding peripheral pulses and S3. These assessment findings are signs of fluid overload. Check for distended neck veins and ascites. Monitor abdominal girth to follow any ascites accurately. Distended neck veins are caused by elevated CVP. Ascites occurs when fluid accumulates in extravascular spaces. Review serum electrolytes, urine osmolality, and urine specific gravity. All are indicators of fluid status and guide therapy. Consider the need for an external or indwelling urinary catheter. Treatment focuses on diuresis of excess fluid. Urinary catheters provide a more accurate measurement of the response to diuretics. Check for excessive response to diuretics. Significantly increased response to diuretics may lead to the fluid deficit. Instruct patient, caregiver, and family members regarding fluid restrictions, as appropriate. Information and knowledge about condition are vital to patients who will be co-managing fluids. Monitor fluid intake. This enhances compliance with the regimen. Take diuretics as prescribed. Diuretics aids in the excretion of excess body fluids. Elevate edematous extremities, and handle with care. Elevation increases venous return to the heart and, in turn, decreases edema. Edematous skin is more susceptible to injury. Consider interventions related to specific etiological factors (e.g., inotropic medications for heart failure, paracentesis for liver disease). Knowledge of etiological factors gives direction for subsequent interventions. Cooperate with the pharmacist to maximally concentrate IV fluids and medications. Anticipate admission to an acute care setting for hemofiltration or ultrafiltration. These therapies are very efficient techniques to draw off extra fluid. Administer IV fluids through an infusion pump, if possible. Pumps guarantee precise delivery of IV fluids. Apply a heparin lock device. This device maintains IV access and patency but decreases fluid delivered to the patient in a 24-hour period. Place the patient in a semi-Fowler’s or high-Fowler’s position. Raising the head of bed provides comfort in breathing. Aid with repositioning every 2 hours if the patient is not mobile. Repositioning prevents fluid accumulation in dependent areas. Educate patient and family members regarding fluid volume excess and its causes. Information is key to managing problems. Explain rationale and intended effect of the treatment program. Follow-up care will be the patient’s or caregiver’s responsibility. Information is necessary to make correct choices in the future. Explain the need to use antiembolic stockings or bandages, as ordered. These aids help promote venous return and minimize fluid accumulation in the extremities. Educate patient and family members the importance of proper nutrition, hydration, and diet modification. Knowledge heightens compliance with the treatment plan.